Infections caused by mule deerpox virus (MDPV) have been sporadically reported in North American cervids. White-tailed deer (Odocoileus virginianus) fawns from a farm located in South Central Florida presented with ulcerative and crusting lesions on the coronary band as well as the mucocutaneous tissues of the head. Evaluation of the crusted skin lesions was undertaken using microscopic pathology and molecular techniques. A crusted skin sample was processed for virus isolation in four mammalian cell lines. The resulting isolate was characterized by negative staining electron microscopy and deep sequencing. Histopathologic evaluation of the skin lesions from the fawns revealed a hyperplastic and proliferative epidermis with ballooning degeneration of epidermal and follicular keratinocytes with intracytoplasmic eosinophilic inclusions. Electron microscopy of cell culture supernatant demonstrated numerous large brick-shaped particles typical of most poxviruses. 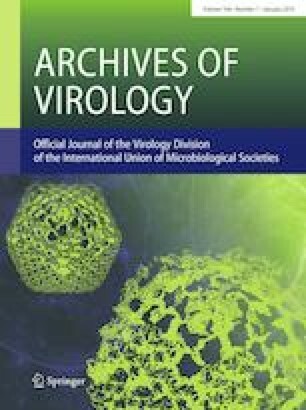 Polymerase chain reaction assays followed by Sanger sequencing revealed a poxvirus gene sequence nearly identical to that of previous strains of MDPV. The full genome was recovered by deep sequencing and genetic analyses supported the Florida white-tailed deer isolate (MDPV-F) as a strain of MDPV. Herein, we report the first genome sequence of MDPV from a farmed white-tailed deer fawn in the South Central Florida, expanding the number of locations and geographic range in which MDPV has been identified. The online version of this article ( https://doi.org/10.1007/s00705-018-3991-7) contains supplementary material, which is available to authorized users. This study was funded by the University of Florida, Institute of Food and Agricultural Science Cervidae Health Research Initiative, with funds provided by the State of Florida legislature. All animal procedures were reviewed and approved by the Institutional Animal Care and Use Committee at University of Florida (IACUC Protocol #: 201609390).